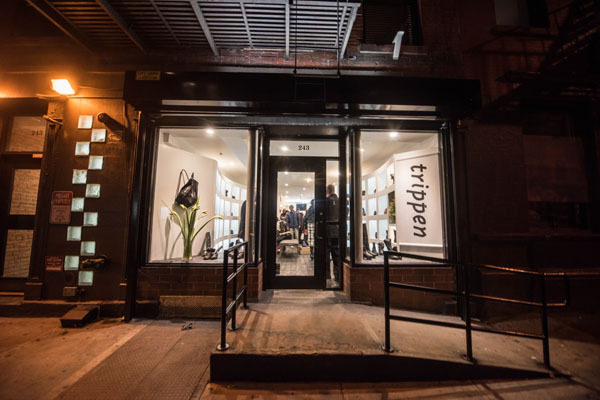 Trippen recently celebrated the grand opening of a their first U.S. retail location at 243 Mulberry Street in New York City. Founder and designer Michael Oehler made the trip from Germany to welcome media VIP’s and special guests who have been anticipating the opening for months. Hot 97’s DJ Wallah played the hottest music! Trippen is a German based company with over 20 retail stores worldwide catering to high-end clients with discerning tastes for fashion and art. Trippen celebrates 25 years this year and is well established in Europe and Asia and worn by celebrities inclusive of Daryl Hannah and Goldie Hawn. Major film projects like “Star Trek” and “300: Rise of an Empire” were equally equipped with Trippen shoes as dancers on Madonna’s “Rebel Heart” Tour. “There is no better way for us to commemorate 25 years than to expand Trippen into the American market, this is a testament to our growth and demand of the Trippen brand,” said Michael Oehler, Founder and Designer. Trippen started in Berlin in the early 90s by Founders and Designers Angela Spieth and Michael Oehler who continue to remain true to their original concept of hand-made designed shoes fulfilling new ecological, functional and aesthetic needs. Environmental regulations and ecological production methods are not only taken into consideration, but have a direct influence on the design. The result is a sustainable shoe that simultaneously offers the consumer a great variety as well as amazing comfort. Innovative construction and pattern techniques produce completely new styles far removed from traditional images. Their autonomous nature outlasts seasons and hype. As a result the models remain permanently available. The unparalleled designs are supplemented by fashionable colour schemes. In the same fashion, Angela Spieth and Michael Oehler developed their unique retail store design with the same integrity of their brand incorporating sensibilities of innovative art, influenced by high fashion and music. Due to their desire to create a new form of footwear presentation, Spieth and Oehler continue to implement in all of their stores worldwide, undulating white walls with illuminated boxes, low platforms that permit a bird’s eye view of the collection, floors covered with handmade terracotta tiles decorated with reliefs of the first wooden shoe collection. In 1996, the first two partner stores opened in Tokyo followed by numerous partner shops in Germany, Great Britain, Israel, Japan, Taiwan, China, Hong Kong and Mongolia. Trippen further owns stores in Berlin, Cologne, Heidelberg, Stuttgart, Munich, Antwerp and Paris and is excited about their New York City launch introducing the shoes for the first time in a specifically designed Trippen retail space to American consumers.